Essential Question: What are the most important things to remember in conducting interviews? Interviews are a “conversation that has structure and purpose” (Merriam & Tisdell, 2015, pp. 108). To conduct an interview one needs to be prepared. According to McNamara (1998), you need to first choose a setting that will provide little distraction. Next you will need to plan how you will explain what you are doing and what the process will be like. Then you will need to decide how you will remember what the interviewee tell you. You could either choose to record the person, take notes during the interview or record as much as possible once the interview is over (Merriam & Tisdell, 2015, pp. 130-131). Next you will need to choose the type of interview you wish to use. Holm-Hansen and Merriam & Tisdell both outline the 3 types. There is the highly structured interview in which “all respondents are asked exactly the same question and provided with a consistent set of response options” (Holm-Hansen, 2007). The second option falls in the middle, the semi-structured interview. In this type the same type of information is collected but they way the questions are asked may differ. In the 3rd type, informal, there are no predetermined questions. This is mostly used to explore a topic. There are 6 kinds of questions an interviewer is recommended to ask. The first is behavior questions, to think about what a person does. The 2nd type of question is opinion type questions where you ask about how a person thinks about something. The 3rd type is feeling where you ask how someone feels about the topic. The 4th type is knowledge where you are trying to figure out what they know. The 5th type is sensory where you want to know about what was seen, heard, felt, or touched. The final type of question is background or demographics (Merriam & Tisdell, 2015, pp. 118). Next you want to consider how you ask your questions. According to McNamara (2015) questions should be open-ended, neutral, asked one at a time, worded clearly, and one should be careful in asking “why” questions. The “why” questions can lead to a dead end if there is no relationship or it could cause the interviewee to get defensive. After going through all of this you should be able to have a complete interview schedule. One reason to do an interview is that “interviews, are believed to provide a 'deeper' understanding of social phenomena than would be obtained from purely quantitative methods, such as questionnaires” (Gill, Stewart, Treasure & Chadwick, 2008). 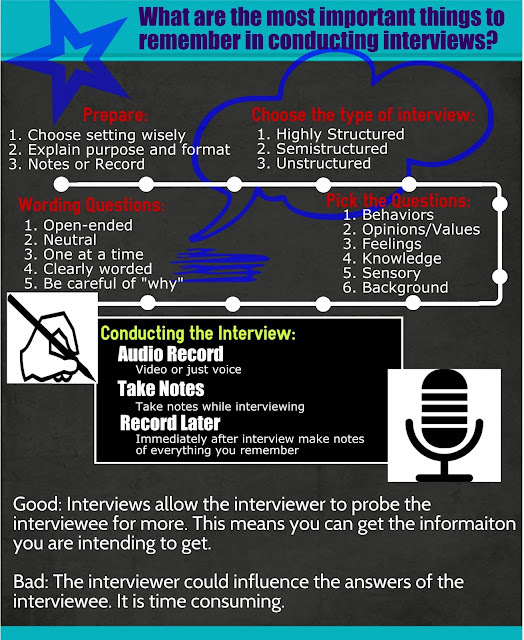 Interview allow the interviewer to probe for more information from the interviewee to provide a more complete picture. Basically you can be sure you get the information you need for your study. A couple of downfalls include the interviewer influencing the interviewee and that recording and transcribing can be very time consuming and expensive (Holm-Hansen, 2007). Gill, P., K. Stewart, E. Treasure, and B. Chadwick. "Methods of Data Collection in Qualitative Research: Interviews and Focus Groups." Nature.com. Nature Publishing Group, 22 Mar. 2008. Web. 9 Oct. 2015. <http://www.nature.com/bdj/journal/v204/n6/full/bdj.2008.192.html>. A definite downfall in my mind is the transcribing. I read in one of my articles this week that interview time to transcribe time is 1:5. That seems like a huge length of time for me. I guess we do talk a lot faster than we talk, but it still seems like a lot. It'll be interesting to interview students and see what kind of feedback we get about our projects since they are in a whole different generation and think a lot differently than we do. Sara- Nice infographic! Oh that is a good point that to choose a setting that will provide little distraction. I didn’t think of that. Especially if you are interviewing younger students because they can get distracted easy. I also like that you point out the six kinds of questions to ask in a interview: behavior, opinion, feeling, knowledge sensory and background. Those are good to know as I don’t really think of what type of questions I am asking. I love your infographic! It appears you were able to find a way to limit the wordiness. That is something I need to work on with mine. Making numbered lists was a nice touch. What type of interview are you planning to do? Are you going to record the interviews or take notes. I don't think there is any way i could take notes, ask questions, and really listen. I think I have changed my mind and I think I am not going to do interviews unless I don't get the data I want. If I were doing interviews I would definitely record and I would probably limit the number of students to start with. If I needed more then I would interview more. Instead of interviews I am going to do a pre and post survey. I will also have all of the tweets and that will make up most of my data. Your infographic is very visually appealing and easy to read. I like that you mentioned the type of questions asked, because it would be so easy for me to just jump right in with the research-relevant questions first, without bothering to ask other types of questions to get the participants warmed up and comfortable. I also liked that you mentioned some pitfalls for interviews. We all seemed to focus on what you should do, but didn't really mention much about what not to do. Those should definitely be things to think about before conducting an interview.